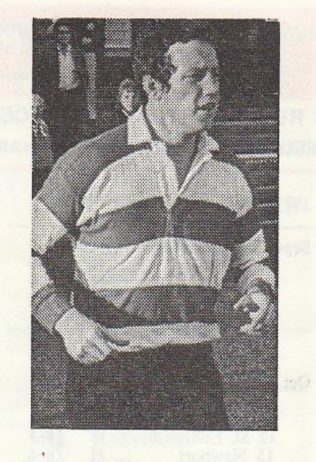 John Haines was a hard working and speedy open side wing forward who played 265 times for Gloucester between 1968 and 1982, scoring 51 tries, and for Gloucestershire in three County Championship Finals. He was also reserve for three England trials. John Henry Haines was born in Gloucester in 1949. He was educated at The Crypt School and played first for Gordon League. While playing for the League, he skippered an England Boys Clubs international team which completed the double over Wales. John made his debut for Gloucester in the 1968-69 season, aged 19. One of his earliest games was against GuysHospital at Kingsholm under the newly installed floodlights. He played in 13 games the following season, but competition for back row places was fierce and it was in 1970-71 that he became established in the side. He also gained recognition by the county for the first time when he was named as “on standby” for the 1971 County Championship Final against Surrey at Kingsholm, but England international Charlie Hannaford recovered and played. He played less for the 1st XV in 1971-72, but did play in the famous victory over London Welsh in the ¼ final of the first club knockout cup, which Gloucester went on to win. He was on standby for the final at Twickenham should Mike Potter have failed a fitness test. In the next four seasons, John Haines played 133 games for Gloucester, scoring 36 tries. He finally made his Gloucestershire debut in January 1973, in a ¼ final against Oxford, and was on the winning side in the next two County Championship Finals: Lancashire at Blundellsands in 1974 and Eastern Counties at Kingsholm in 1975. Haines appeared infrequently for Gloucester in 1976-77 due to back and knee injuries, missing the entire county season. He returned the following year and, after scoring the winning try in the semi final against Kent at Blackheath , he again played in a County Championship Final, this time against North Midlands at Moseley. However, he was unable to break into Gloucester’s John Player cup winning XV, which played unchanged throughout the 1977-78 campaign, although he played 20 games for the club that season. John Haines toured South Africa with Gloucestershire in 1975 and North America with Gloucester in 1977. I played with John at Gordon League and he was a great talent and club player then, very fast to the breakdown and fearless. He would have shown a few modern players up today. A player for the fast track. Thanks John.